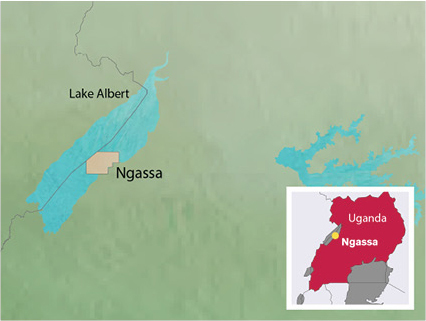 Oranto applied in the Uganda first competitive bid round for the Ngassa block, which exists predominantly across lake Albert extending to the median line with DRC. Most recently the block was held by Tullow Oil, which drilled two wells on the block confirming the presence of both a shallow gas play and a deeper oil play. Oranto was confirmed as the successful bidder for the Ngassa block and signed in October 2017 the PSC with the Ministry. Export of fluids to be produced from the bock will be via the 1444 km long pipeline spanning Tanzania to the port of Tanga. The block is immediately north of the CNOOC operated Kingfisher field. A number of closures at different stratigraphic levels have been mapped, which may yield in place oil volumes of 311 mmbls. The very young rift system has well operational challenges that most likely require an in-lake drilling solution such as a barge to allow the drilling of vertical wells to test a shallow gas play identified on seismic data and a deeper mega closure anticipated to host recoverable oil reserves of >100 mmbls.